On February 7, 2012, Tammy Cmt (Charcot Marie Tooth) wrote a recommendation for Michigan Dog Trainer on her facebook page and sent notice to us of her dog’s (Zarr’s) progress. She and her husband Doug, previously spent an hour with Michael Burkey to evaluate Zarr and give them advice as how to deal with his aggressive tendencies toward Doug. how to counter-condition him to things he was afraid of. They will also participate in our Remote Manners group dog class to teach Zarr new manners and reliable obedience to basic commands. Tammy and Doug, thanks for the update on Zarr. We always love hearing about progress owners make with their dogs. Congrats on your progress and commitment to Zarr. He is very lucky to have the two of you in his life. We look forward to continuing to work with you and Zarr too! For help with your dog, contact Michael Burkey of the Michigan Dog Trainer. Note, we do not recommend placing your face so close to a dog’s face that may show aggression. This can cause social pressure for a dog and they may respond by biting your face as a way to create more distance from you. 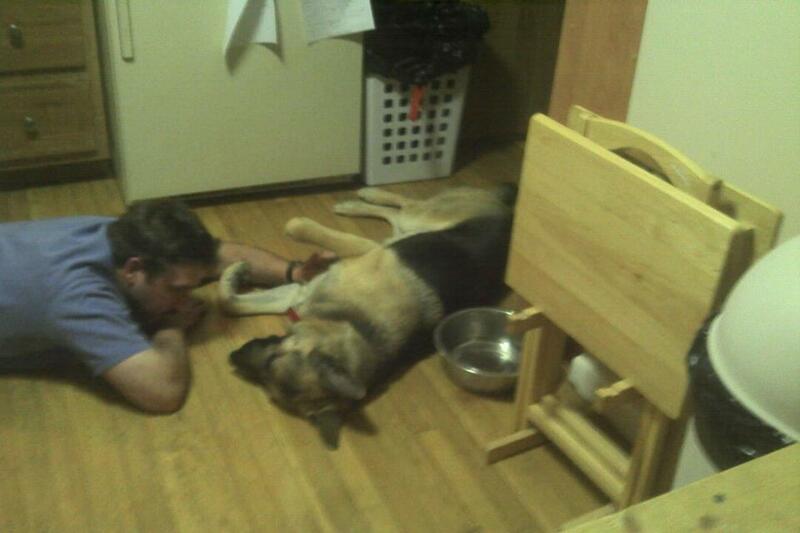 However, Tammy and Doug sent us this picture as an example of the progress they have made with their dog. Previously, Doug could not pet Zarr without him growling or attempting to bite him. This entry was posted in Testimonials & Case Reviews, Uncategorized and tagged aggression, aggressive dog, dog, dog aggression, German Shepherd, German Shepherd dog, michael burkey, Michigan. Bookmark the permalink.